Yeah, but: They're just like the #8, but more so. 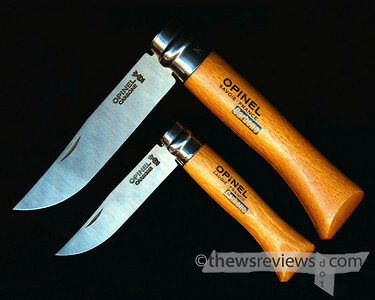 The Long Version: I reviewed the Opinel #8 knife back in the beginning of December, and liked the 8.5cm model so much that I decided to pick up the smaller and larger sizes as well. The #6 has a 7cm blade, and the #10 is 10cm long. A centimetre and an half either way doesn't seem like much, but it makes a huge difference in the character of each tool. The fundamentals of the construction is unchanged from the #8, so I won't repeat those parts of my first review, and instead will skip straight to what I've learned from these two. The biggest surprise of adding these two knives to my collection is that each blade has a different thickness. The smaller #6 is thinner, while the #10 is thicker. That doesn't sound all that profound, and it makes perfect sense, but these knives are so inexpensive that I was keep expecting them to be cheap. Instead they're each tuned to their own best use without unnecessary compromises. The other surprise is that the locking collars are nowhere near as stiff as the one on my #8, with the #6 being quite loose, so there is an element of variability in the manufacture and/or quality control of these knives. The #6 is a very small knife, having a thinner handle that's easier to carry in a pocket, and it does a very good job at breaking packing tape and slicing paper. This is mostly what I use a knife for, making the #6 my usual choice, but it gives up the versatility of the bigger #8. The #10 is the same sort of thing but in the other direction, being substantially bigger with a much heftier handle, making it less suitable for general use but better at the 'big knife' tasks that might come along. I'm still not sure that I'd pick it over a Buck 110 as a working knife, but it's much lighter with a very similar - but slightly thinner - blade. If I were to accidentally go camping, I'd want the #10 for utility tasks, but I'd still want the #8 for kitchen duties. Now that I own three different sizes, I'd still recommend the intermediate #8 as the best general-purpose tool. The smaller and larger sizes have their specialties, and are very useful for light or heavier-duty tasks, so if you know you'll need one or the other then you can't go wrong. After all, they're under $20 each, so there's no reason not to have a variety. Just a heads up about the locking ring tightness, You can remove the ring (there is a vid on youtube) and crimp it a little before putting it back on if it is really loose.